We believe that marriage is an important institution and delighted that as of March 2014, it is open to everyone. 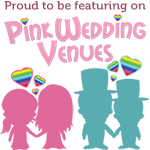 Hadley Park House Hotel is proud to offer some of the best facilities to hold a gay wedding in Telford, Shropshire. Hadley Park House Hotel is a gay friendly wedding venue and has a choice of rooms licensed for Civil Wedding Ceremonies and Partnerships. Our Georgian Manor House is set in 2 acres of beautifully landscaped grounds and offers an amazing backdrop for picture perfect moments. There is a choice of facilities at Hadley Park House Hotel to ensure you have the very best and most memorable of days at your special civil partnership or lesbian wedding celebration. Whether you are planning a smaller, intimate affair there is a choice of rooms. Many couples choose to hold a ceremony in the conservatory, with bags of natural daylight and beautiful draped ceilings make for an atmospheric, intimate setting. The larger Mulliner Suite can hold up to 140 wedding guests in the day and 200 in the evening and is ideal for larger celebrations and as it has its own entrance and bar, is completely self-contained. Hadley Park House Hotel produces award-winning food and offers a wide choice of menus and there’s also the option to try the dishes before making your final selection for your guests. You and your guests are guaranteed a friendly, welcoming experience, and our team adopt a personal approach to ensure that your day is a truly memorable experience and exactly how you’d envisaged. With 22 bedrooms, Hadley Park House Hotel can accommodate guests who may be travelling from further afield. Staying over on your wedding night in one of our spacious luxury honeymoon suites is the perfect way to started married life – it also means that can extend the celebration and catch up next morning with your guests at breakfast. Hadley Park House Hotel is the perfect setting for your civil partnership wedding ceremony.